The first images apparently showing the man who launched a terrorist attack in central London on Wednesday have appeared in the UK media. 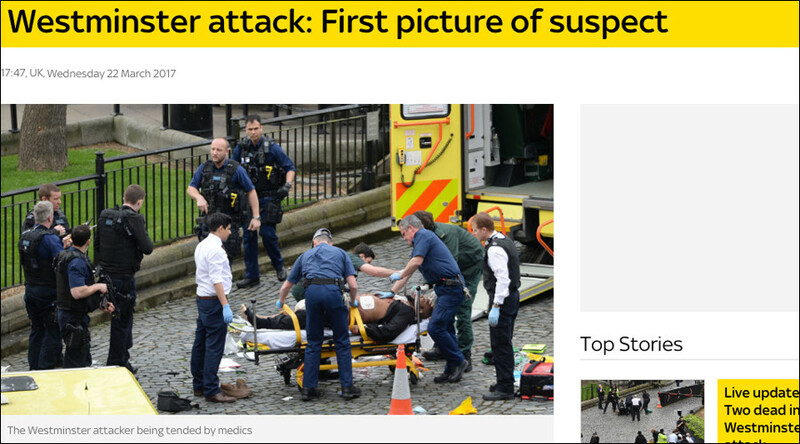 In photographs published on the Twitter accounts of UK media, the man believed to be the attacker can be seen lying on his back on a stretcher, with medics attending to him and police officers standing nearby. A large blood-stained bandage can be seen on the man's torso. A zoomed-in image circulating in UK media also shows what appears to be a knife lying on the ground near the stretcher. The same photo was published by the Mirror, Sky News, the BBC. Another photo taken at the scene partly shows a person in brown shoes lying on the ground, apparently held at gunpoint by a police officer. What looks like a knife can also be seen on the ground by the officer's boot. A sole attacker is believed to be behind the terrorist incident in Westminster, central London, on Wednesday afternoon, police told the media at a briefing. At least four people, including the suspect, were killed and about 40 injured in the attack, police said. The attacker is believed to have been driving a car which mowed down pedestrians on Westminster Bridge. The suspect then reportedly rammed his vehicle into the gates of parliament, and fatally stabbed a police officer inside the parliament grounds.